Welcome to Okawville Equipment where the variety of equipment is hard to compare. We offer Sales, Service and Parts Support on the following brands: Kubota, Land Pride, STIHL; Husqvarna, Briggs & Stratton engines, Kohler engines, Kawasaki engines, Honda engines. We are also an EZ-Trail dealer and provide lawn mower service on most makes including Snapper, Cub Cadet, Hustler, Exmark, Toro, Ferris, and many more. 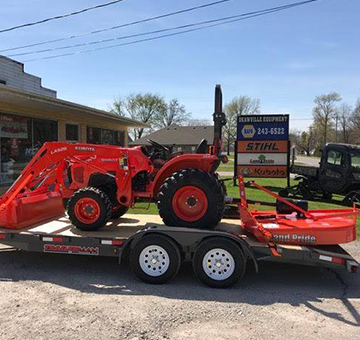 Our friendly and knowledgeable staff is happy to provide you hometown service whether you are looking for that perfect piece of equipment, parts, or service. Visit us at our easy-to-find location for all your outdoor power needs. Call us in Okawville at 618-243-6522 for any questions you may have before you travel. We know individuality is important, which is why we pay close attention to the interests of each customer. From the minute you walk through the door, meeting your needs is our top priority. Founded not only on excellent customer service, but also on the principles of hard work and a focused attitude, we have a long list of satisfied customers. Call, fill out a contact us form, or stop by; you’ll be glad you did!